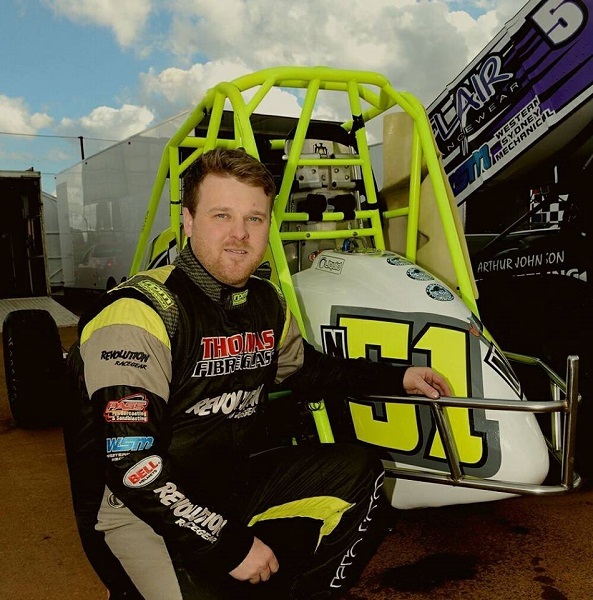 Ahead of the 2018 Australian Wingless Sprints Championship, which is set to commence tonight with the opening night of competition at Sydney’s Valvoline Raceway, Totally Speedway’s Daniel Powell shares his top-10 contenders. As the one of the few drivers amongst the field who have never visited the Valvoline Raceway track before, track experience isn’t on Redpath’s side; however, the current Tasmanian Champion was a force to be reckoned with in last season’s Australian Championship, coming home in a strong second place. While track time certainly isn’t an issue for him, having contested a busy schedule this season between Wingless Sprints, Speedcars and Speedway Karts and collected a total of 8 feature-race wins so far this season, will Redpath be race hardened for the 90 plus competitors he’s soon to face? The big question mark heading into the Australian Championship is no doubt Martin, who recently exceeded expectations and delivered a career best performance in the NSW Title, coming from eighth in the pole shuffle to start the feature race on the outside of the front row and going on to complete the podium in third. Hungry to prove his impressive performance was no fluke, Martin showed that he wasn’t afraid to go up against the country’s best drivers, but can he back it up under the pressure of the Australian Championship? Despite not having much experience at the Sydney venue, Weel, who is regarded as one of the country’s fastest racers, has proven that he can qualify well in title events, having earned pole position in the previous two Australian Championships – Toowoomba’s Hi-Tec Oils Speedway and Carrick Speedway – but has been unable to go on with the job. Showing good speed in his past visits to the track, the most recent of which was the NSW Title where he placed 13th due to experiencing dramas throughout his heat races, Weel will be hoping that the third time’s the charm as he shoots for a hat trick of Australian Championship pole position starts. However, on this occasion, he wants to finish the weekend on the top step of the podium. As a two-time Australian Champion, it’s hard not to include Hartigan in our predictions. Making the long trek to Valvoline Raceway for the first time in his career to contest the NSW Title, where he was running strongly inside the top-10 up until an incident with another driver towards the end of race resulted in him spinning out and being sent ROF. Despite the disappointing end to his NSW Title campaign, he showed great pace for a driver who had never seen the track before and he certainly won’t let his lack of track experience get in the way of his hunt for Australian Championship win # 3. In a class where consistency is vital, Sayre has definitely been hitting his marks this season, with a feature-race win at Gilgandra Speedway and two minor podium finishes at Valvoline Raceway under his belt. Currently sitting third in the NSW Club Championship point standings, the 18-year-old racer was disappointed to run 11th in the NSW Title and will be looking to make amends in the Australian Championship. If he can qualify strongly, he’ll no doubt be a threat. A regular front-runner on a domestic level, with four-feature race wins to his name this season, Lismore’s Eggins is one of the form drivers in Northern NSW. Having his best ever run at Valvoline Raceway with a pleasing fourth place in the NSW Title, this result will give Eggins a good foundation for a strong Australian Championship performance. Recently being forced to qualify for the NSW Title feature race via the B main after a crash during his heat races, going on to salvage a top-10 finish, Chadwick is another example of why a strong qualifying result is so important. While he may have limited Valvoline Raceway track experience, the defending Australian Champion knows just how to handle the pressure of a title event and will leave nothing in the tank in his attempt to claim back-to-back wins. After qualifying on pole for the NSW Title and ultimately slipping back to eighth, Bates will be determined to bounce back in the Australian Championship. Carrying the confidence of having won the 2016 NSW Title at the Sydney track, along with a multiple feature races, Bates will without a doubt be a contender, so be sure to keep an eye on the green machine! At a place where experience counts for everything, we certainly can’t forget about veteran racer Blyton, who has completed more laps around Valvoline Raceway than any other driver, having made his first appearance at the track in the early 1990s. After challenging for the lead in the NSW Title before being forced to settle for the runner-up spot when his car setup dropped off in the latter stages of the race, Blyton will be hungry to go one better in the Australian Championship and achieve his maiden Australian Championship victory. All eyes will be on Thomas during the Australian Championship, after his impressive and dominant victory in the recent NSW Title. As the current Valvoline Raceway Track Champion, all thoughts lead to Thomas running at the pointy end of the Australian Championship feature-race field, but his rivals certainly won’t make it easy! Honourable Mentions: current Australia # 3 Daniel Storer (Vic), current Victorian Champion and Australia # 4 Glenn Watts (Vic), current Northern Territory Champion Troy Carey (NSW), current Queensland Champion Daniel Flood (NSW), Matthew Iwanow (WA), Travis Millar (Vic), Harley Smee (NSW), Ashleigh Jack (NSW), Peter Logue (Vic), Peter Granger (NSW) and Jason Davis (NSW). The above top-10 predictions are just a guide and only just scratch the surface in terms of the number of likely front-runners. All we know is that the 2018 Australian Championship will no doubt be an action packed and extremely competitive event! Event Information: Having commenced yesterday with scrutineering and the Calcutta, the opening night of Australian Championship competition commences tonight with hot laps, three rounds of heat races and a preliminary feature race, followed by the fourth and final round of heat races, the D main, C main, B main and the Australian Championship-deciding feature race tomorrow night. Get Social: For more information on the AWSR, visit their website at www.awsr.com.au or LIKE them on Facebook or Follow them on Instagram and Twitter by searching Australian Wingless Sprint Racing.